When is the Best time to Visit Gulmarg ? Continuing from the previous article where I talked about planning a Gulmarg trip; in this article I will provide some information on when is the best time to visit Gulmarg. To be honest, there is really no straight answer to this question as it would really be different for every person. Not every individual visits for the same reason. Some people would come looking for snow while others for lush green meadows. The adventurous lot would visit Gulmarg for some snow sports whereas a lot of people come to a hill station looking to spend some time in peace. Hence in this article, I will provide a breakdown of how Gulmarg is at different times in a year; and hopefully after reading through this, you will be able to decide when should you plan on visiting. Tourism in Gulmarg is not really a thing limited to a certain period. This tiny hamlet serves as a year-round magnet to its admirers. It is a serene place that can be visited throughout the year. No matter which month you arrive in here, I can bet that you will not be disappointed. 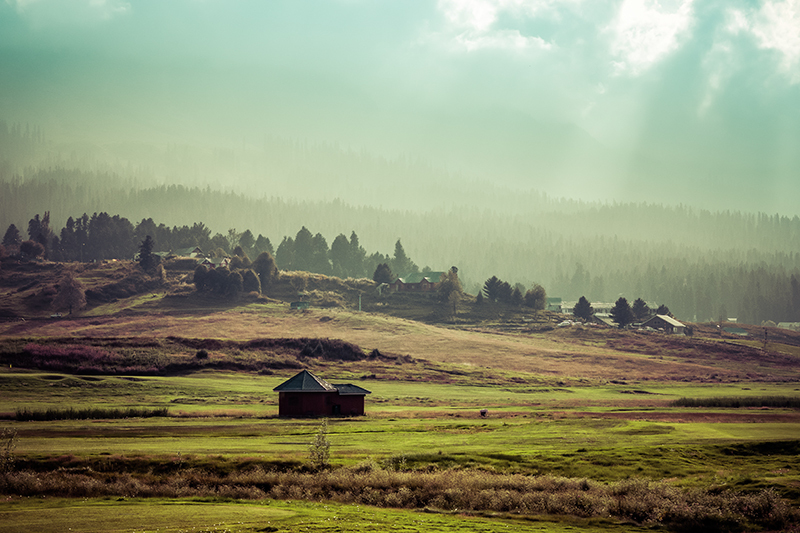 When is the Best time to Visit Gulmarg? Is you were chasing snow and hoping to catch a live snowfall; then visiting Gulmarg in the months of January or February would probably be the best. If you wanted to however witness the spring in the meadows of Gulmarg then the months of April and early May will be best. If lush green valleys were on your mind then plan sometime in July, August or early September. If you wanted to be away from crowd and wanted to be here with less number of tourists then you should think about visiting either in March or August. The months of April till June sees a huge number of tourists in Gulmarg. This is the time when you would have to wait in line for 2-3 hours a 15 minutes Gondola ride. Unless this was the only time you could afford to plan this trip, I would recommend avoiding to visit Gulmarg in these 3 months. It starts to snow in Gulmarg towards December end and continues till March. The frequency and intensity of snowfall will be greater in January and lowest in March. The snow remains for a little after as well but chances of catching a live snowfall become rare. Normally the area above the gondola middle station (3’050 m) remains covered in snow from mid-November till around the end of May. In the lower area of Gulmarg town however, it may take till mid-January for the snow to stick to the ground. The snowfall may occur towards late December but the snow usually melts away. At the top station of the cable car (4’000 m), the top of Apharwat peak, you may find snow till the end of July. For a regular tourists, this usually suffices. If you however want to see Gulmarg buried under several feet of snow then plan between Mid-January and February. For someone interested in some serious skiing, best time for you would be February. If you are someone interested in a bit of photography, the I personally would recommend visiting either in February, April or August. In Feb, you can get some really stunning snow covered valleys to shoot. It will be there in other months as well but not as much as in Feb. In April and August, it is the lush green valleys all around and you will definitely be able to get plenty of good shots. Rest of the months present plenty of photographic opportunity too but vistas in these three months would be at their best. All months I would say. Gulmarg remains open for tourism throughout the year and you can bring your families anytime when you can manage to. None to be honest. Gulmarg is really a place a bit on the expensive side and I am speaking this out of personal experience. You will not find a place to stay here for any less than Rs. 2000 to Rs 2,500 during tourist season. Food here too is costly. I paid Rs. 20 for one tawa roti at a road side restaurant, can you imagine? Still, if you were on a budget then I would recommend coming sometime in August. At this time, there aren’t many tourists around and your chances of getting a cheaper hotel deal are better. Weather of Gulmarg remains to be very cold during winter season and pleasant during summer. Below is a month by month breakdown of how the weather trends throughout the year; and how the temperature fluctuates. It is peak winter season and you will feel the chill in the wind. Pack all your woolens and heavy windproof jacket if visiting this time. Temperature of Gulmarg in January will remain about 3 degrees Celsius at an average. At nights, it can drop down till -5 to -7 and at noon, will rise up till 12 Degrees Celsius. It can snow anytime but the amount of snow on the ground will be a bit less towards earlier part of the month. Also Read: How to Plan your Journey on Mughal Road? Pretty much the same deal as January. The difference however is that the amount of snow accumulated on the ground will be far greater. Average temperature in February will remain around 7 Degrees Celsius; lowest at -5 and highest at 10. You will definitely need to keep heavy woolens for visiting at this time. Average temperature in Gulmarg in March goes up to around 10 degrees Celsius. Night temperature will hover between 0 to 5 degrees Celsius whereas during day, it may very well jump up to between 25 to 30 degrees Celsius. Snow will start to melt from lower Gulmarg and get limited to areas around Kangdoor and above. Some light woolens and a good windproof jacket will suffice for the trip. Spring arrives and the weather turns pleasant. Average temperature jumps up to about 15 Degrees celsius. Night temperature will still remain around 1 to 5 degrees but during day, it can even reach in 30 degrees. Just pack a light jacket and plenty of cottons for visiting this time. This is the time when Gulmarg gets really very crowded with summer vacations in schools on and people arriving with their families. Not really a good time to visit unless this is the only time you can come. Gulmarg’s average temperature in this month remains in 20s; with night temperature between 5 to 10 and day temperature between 30 to 35 degrees Celsius. So yes, it can even get hot around here in May. Pack a light jacket and plenty of cottons for visiting this time. Another not so good month. Vistas will be a bit dull and it will still be crowded. Weather too will feel hot with average temperature close to 25 degrees Celsius. Nights will however between close to 10 while day temperature may even reach 35 degrees sometimes. Towards late June, Monsoon arrives in the region and it starts to rain as well. Pack a light jacket and plenty of cottons for visiting this time. July is the warmest month of the year in Gulmarg with average temperature remaining close to 25 Degrees Celsius. Nights will feel pleasant at 15 Degrees where days will definitely be warm between 30 to 35 Degrees. Sometimes it can go up even beyond 35. July also officially marks the beginning of monsoon season here, though it doesn’t rain too much in Gulmarg. The plus point of visiting in Gulmarg July however is that you will rarely find any tourists here at this time. You can get better deals at the hotels which also makes it a good time for budget travelers. Pack a light jacket and plenty of cottons for visiting this time. Monsoon starts to recede leaving behind lush green meadows. Tourists won’t be too many in numbers and it is a great time for photography enthusiasts and budget travelers alike. Temperature in August will average out at 25 with nights remaining pleasant at around 15 and days warm between 30 to 35. Pack a light jacket and plenty of cottons for visiting this time. Grass will start to dry by now and green will be fading. Weather will start to turn cold again and average temperature will drop down a bit close to 20 degrees Celsius. Nights will be cold at 10 but days still a bit warm at around 30 Degrees. In terms of clothes however, you can still easily survive with cottons and some lights woolens or jackets. October officially marks the beginning of winter season in Gulmarg and you will be able to feel it in the air. Average temperature will dip further to between 10 to 15 Degrees Celsius; nights at 5 and days at 25. It is also the time for autumn in Gulmarg and a great time to visit for those eager to see the orange all around. If you are a photographer, then you will be able to get some great Autumn shots in the valleys of Kashmir. November is not at all a good month to visit Gulmarg. Vistas will be dull all around, there will be no snow and weather will be very cold with average temperature at 8 Degrees. Nights will start to freeze with temperatures between -1 to -5. Days however will be pleasant still at around 20 Degrees. It also starts to snow at this time in the upper areas near Kangdoor and Apharwat peak. It is the peak of winter season now with average temperature in Gulmarg at around 2 to 3 degrees Celsius. While days will still be at around 15; nights will be freezing cold at -5. By end of December, it can snow time in Gulmarg town. For visiting in either October, November, or December, you must pack all your good woolens to help protect against the cold. And I think that is pretty much all there is about the best time to visit Gulmarg. If you feel I missed out on any information and have further questions; please feel free to ask in the comments section below; or at our Community Forum; and I will be glad to answer. Hey, can you suggest some good places to stay during jan end or fev? I stayed at Hotel Affarwat. It was good. There is another one called Pine View Resort that you can check. Not Hotel Pine View but Pine View Resort. Thank you bhai for this useful information. This much information shows you are perfect for traveling and to explore different places in different times. Good luck for the next destinations. Thanks Honey Bhai for your kind words.